During the American Revolution, thousands of slaves fled their masters to find freedom with the British. Epic Journeys of Freedom is the astounding story of these runaways and the lives they made on four continents. Having emancipated themselves, with the rhetoric about the inalienable rights of free men ringing in their ears, these men and women struggled tenaciously to make liberty a reality in their own lives. This alternative narrative of freedom fought for and won is uniquely compelling; historian Cassandra Pybus’s groundbreaking research has uncovered individual stories of runaways who left America to forge difficult new lives in far-flung corners of the British Empire. Harry, for example, one of George Washington’s slaves, escaped from Mount Vernon in 1776, was evacuated to Nova Scotia in 1783, and eventually relocated to Sierra Leone in West Africa with his wife and three children. Ralph Henry, who ran away from the Virginia firebrand Patrick Henry in 1776, took a similar path to precarious freedom in Sierra Leone, while others, such as John Moseley and John Randall, were evacuated with the British forces to England. Stranded in England without skills or patronage during a period of high unemployment, they were among thousands of newly freed poor blacks who struggled just to survive. While some were relocated to Sierra Leone, others, like Moseley and Randall, found themselves transported to the distant penal colony of Botany Bay, in Australia. Epic Journeys of Freedom, written in the best tradition of history from the bottom up, is a fascinating insight into the meaning of liberty; it will change forever the way we think about the American Revolution. "Epic Journeys of Freedom is a well-written and engaging narrative history that also happens to be the fruit of prodigious research." "This gripping and enlightening book explains in vivid and eloquent prose how these fugitives struggled for civil and human rights before, during, and after their escapes . . . an impressive and extremely important work. Readers will obtain a much greater understanding of an aspect of the American Revolution that finally gets some much-deserved scholarship. Highly recommended for all libraries." " Just amazing. What a gripping narrative. Epic Journeys of Freedom is a truly heroic story of the exodus of runaway slaves that covers four continents: North America, England, Africa, and Australia. And Pybus has such command of the sources. An awesome achievement." "In the midst of the American Revolution…Historian Pybus traces the paths of several former slaves, including those of George Washington, as they fled America for freedom, and she profiles famous and lesser-known figures who fought for freedom for enslaved blacks during the American Revolution. Pybus also offers a rare look at how the former slaves were received in London and how they fared in the two colonies set aside by the British for them in Sierra Leone, Africa, and Botany Bay, Australia. Along with detailing the personal challenges facing these former slaves and showing how they managed, while enslaved, to forge ideals of individual freedom, Pybus demonstrates that the Civil War and the civil rights movement have roots in the American Revolution." "Through meticulous archival research, Cassandra Pybus has woven together the extraordinary quest of enslaved African people who gained freedom in the age of revolution for a promised land. This is a story of exceptional courage, endurance, and religious commitment among black founding fathers who have never been properly recognized. That among them were former slaves of George Washington, Patrick Henry, and other white founding fathers makes this book all the more engaging." "A wonderful book-Epic Journeys of Freedom is based on extensive and creative research and makes an important contribution to African American Studies and to African diaspora studies. The challenge to escape and to end slavery, the transnational flights and fights are dramatically captured in Cassandra Pybus's compelling and provocative account of courageous men and women determined to be free. This is essential reading." "Cassandra Pybus produces revelation after revelation as she tells the personal and collective stories of an astounding African American quest for freedom that led to faraway places. New light is cast on the American Revolution, on the human spirit, and on the ironies of history." 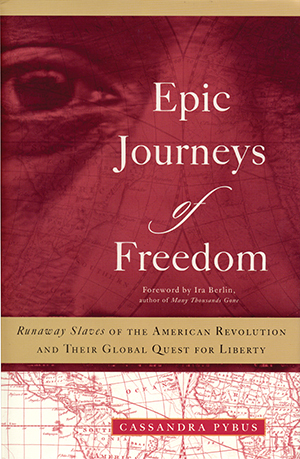 "Epic Journeys of Freedom is an important book, a heartbreaking book, and a narrative marvel. From scraps of information patiently gathered on four continents it brings to life American slaves who attempted to forge their own freedom, and in the process weaves together themes in eighteenth-century history that have been for too long separate."